Ron sent me this one of Uncle Alec, not long before he died on the operating table, with Aunty Vi and Lucky during their 1960 summer holiday in Cornwall. Aunty Vi died in England in April this year, and her son Ron had arranged a memorial service for her in August. She was mum’s last surviving sibling. That was it: a generation come and gone, at least in this family. My sister and I and our cousins had abruptly and a little unwillingly become the older generation. I felt that I had to attend this memorial service, and not just because Aunty Vi and I had grown closer since mum died in 1996. It was a symbolic moment: the torch had been handed over. The divorce made it difficult to attend: money has been tight, and my ex- did not cooperate in scheduling our respective vacations: wonder why! But I finally remembered frequent flyer miles, and at the last minute arranged for Charlie and Alex to be looked after by responsible adults for ten days and flew to Heathrow by myself. There’s a limit to how much divorce should be allowed to disrupt the important things in life. Then I brought Tom over from Paris on the Eurostar to meet me in London, and the two of us arrived at the cemetery by train about five minutes before the memorial service started, complete with a suitcase, backpacks and his guitar. Tom is my kind of travel companion! This is the grave, the large stone in the right foreground, taken from its back in 2010. The red brick Abbey is in the background. The railway lines are behind the photographer, and the road behind the Abbey. 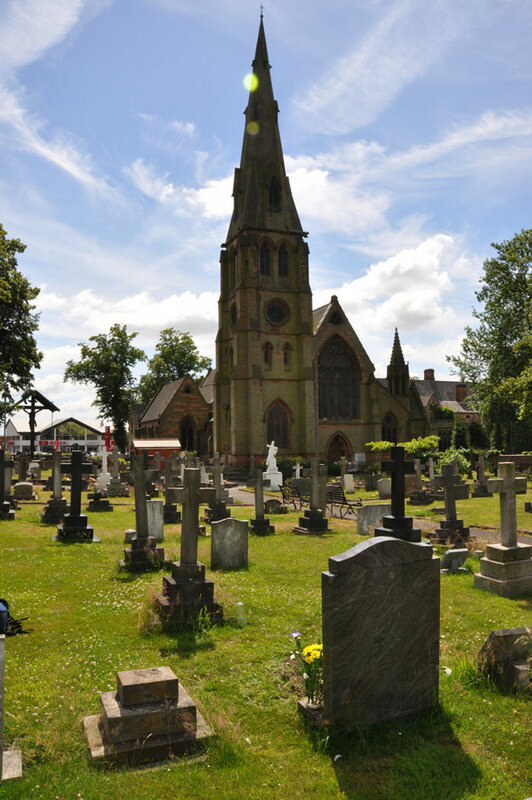 The service was unusually sweet for the Catholic Church, with the priest standing with us in the graveyard of the Abbey, Erdington, by the grave where Aunty Vi’s ashes were to be interred. Mum and her parents were already in that grave, and the ashes of Margaret, their older sister, were already interred there. The priest’s words were a simple tribute, simple and moving. It was a beautiful day, and there was quiet weeping in our little group of close relatives. No pictures were taken of those intimate moments, despite all the cameras in hand: we were a family united in its sorrow. Of course, the Church is incapable of doing everything right: that hasn’t changed! Its issues are also visible in this grave. Uncle Cyril, mum’s, Vi’s and Margaret’s only brother, died childless and a bachelor in 1996, and was cremated as he requested. The Church refused to permit the interment of his ashes in the grave, a position that has apparently evolved in the intervening 16 years. As a result, his closest friend came into the graveyard at midnight one night and quietly scattered the ashes on the grave: good for her! We count him as being there too. 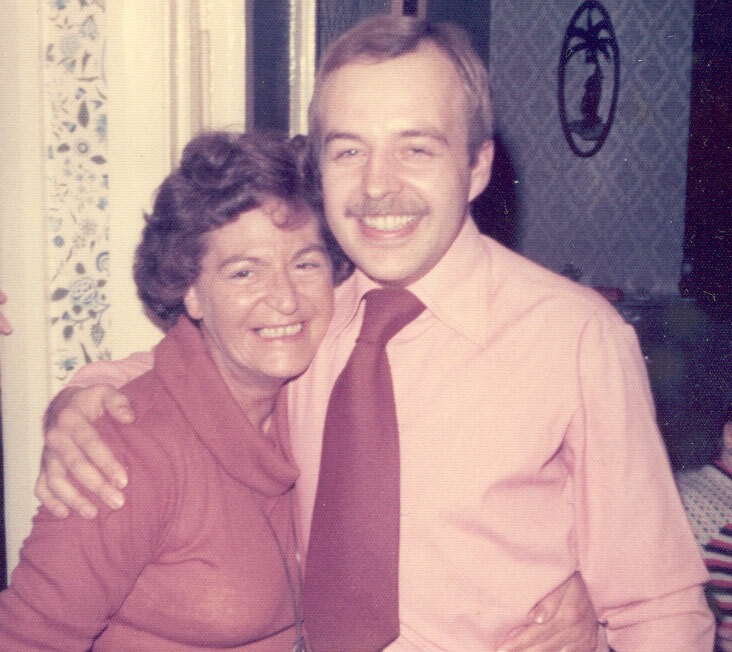 Aunty Vi at a party at our house in Marlow in 1974- ish!! I don’t really remember what was happening around this photo. On this occasion her dance partner was Nigel Millington, a friend from Borlase’s. She loved to dance! Nothing like a memorial service to lead you back. I was thinking about a soccer game near the block of flats where the Warringtons, Aunty Vi and her boys, lived when we Stocks lived on the other side of Birmingham. I was about 12. Her oldest son Dave was playing forward, and I wanted him to score so badly. Then there was the time she was right at home dancing to 1970s rock with my school friend Nigel Millington at a party in Marlow in 1975. Scared of the dance floor then, I wished that it was me dancing with her. A widow since the early 1960s, she had supported her sons with a long career as a telephone company operator. She alone had raised two teenagers to become kind and decent men in a world of cheats and charlatans. She laughed all the time and rarely complained, even as the symptoms of aging became more prevalent. As she aged, I realized how much she was like mum, only with better health. The four cousins present, Peter, Ron (with Louise), me and Sue (with Derek). Aunty Vi would have loved to see us all laughing together. Four of the six cousins, the Smith sisters’ children, our generation, the generation being handed the older generation’s baton, were together at the reception held after the service, for the first time in I don’t know how long. We drank pints together or glasses of wine, caught up with each other’s news, and gossiped shamelessly. Pip’s hunting season would start the next week, but of course he would not hunt on the sabbath, and Ron is still planning to visit the US some time soon. Aunty Vi’s grandchildren, Alec and Leon, and their wives, Sarah and Tammy, were shepherding her great-grandchildren and their little friends, all of whom frolicked and scampered around here and there in the park outside. The young mothers sipped on their wine between laughs, and the young fathers chipped in with plenty of goodwill. Tom played the guitar and sang for the family, just as he had played and sung two years before for Aunty Vi in her rest home. She felt present throughout. Whirling around us, her assorted children, grandchildren and great-grandchildren were as meaningful a tribute to her life as you could wish for. 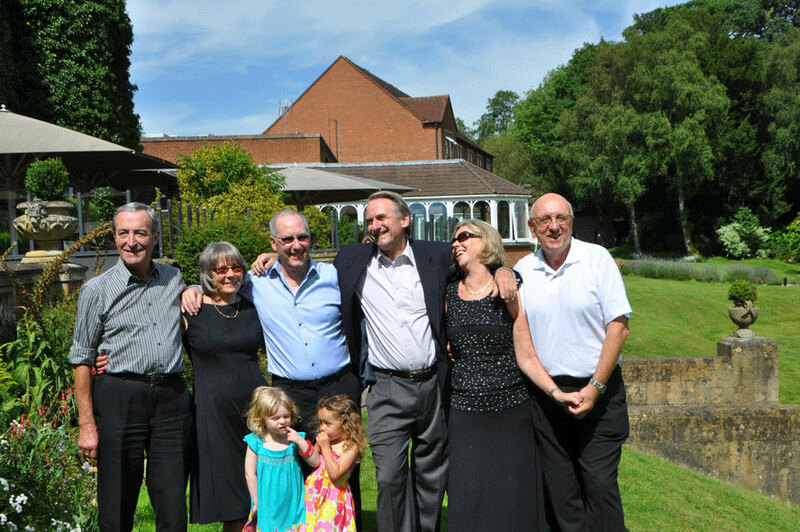 Aunty Vi’s direct descendants, the Warringtons, at the reception in Sutton Park after the memorial service. Dave, her older son and the Australian side of the family, had visited his mum for her 90th birthday, but couldn’t leave his store in the outback again so soon after. 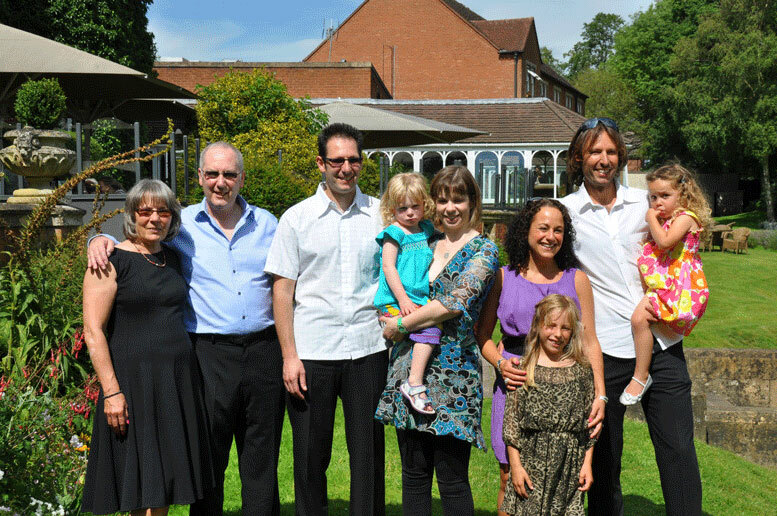 With Ron and Louise are Vi’s grandchildren and great grandchildren, their sons Alec (with Sarah holding Emma in her arms) and Leon (holding Luna) with Tammy and Thalia in front of her. Aunty Vi was one of two surrogate mothers I latched onto after mum died: Aunt Angela was the other. They were born within nine days of each other in October 1921. Aunt Angela was more of a third cousin twice removed than an aunt, but we had first met around the time mum died, introduced by her daughter Veronica, and had hit it off. Angela and Veronica almost made it to Marie-Hélène’s and my wedding: prevented by car trouble, they happily showed up a week later and instead accompanied our fast-moving family to EuroDisneyland east of Paris. Angela during our visit to Disneyland in Marne-la-Vallée, May 1997. This was the first time that we met. 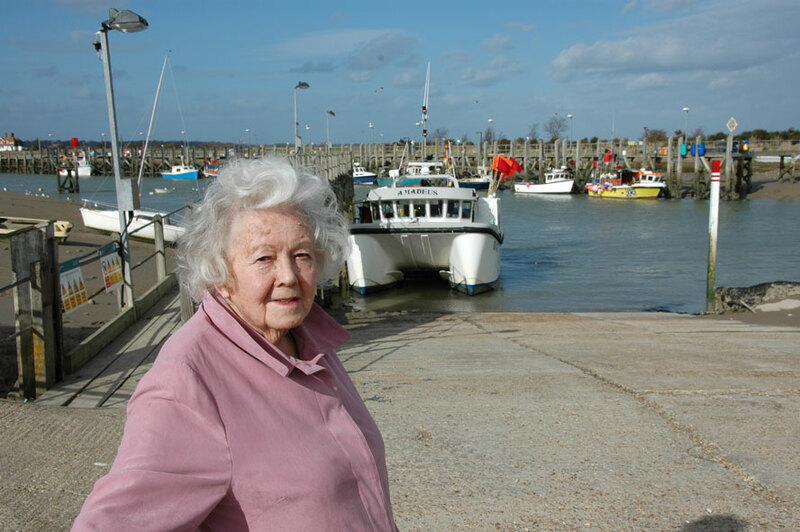 We had kept in touch since: she was a source of fascinating anecdotes about the past, and I visited her regularly at her home in Rye, East Sussex. The visits were normally pretty random, but on this occasion I had an agenda, prompted by a discovery that Aunt Angela herself had catalyzed. Years before, she had asked me to find out about her relationship to Albert Coates, an Anglo-Russian conductor in the 1920s and 30s. The results of that little piece of detective work are summarized here: https://iansmemoirs.com/an-internet-detective-mission-for-aunt-angela/. Following up later on those results, I stumbled upon one Guy Penrose Gibson, who was a member of Angela’s grandmother’s sister’s family. I wanted to ask Aunt Angela if she had known him herself. I had first read about Guy Gibson as a teenager in Marlow in 1967, in Paul Brickhill’s “The Dam Busters.” They were a squadron of Lancaster bombers who successfully breached two dams in the German Ruhr Valley in 1943 using bouncing bombs invented by Barnes Wallis. Gibson was their Wing Commander, the man in charge of the mission and at 24 one of the most experienced bomber pilots in the entire RAF. I was reading about him at an epoch when growing your hair long was considered to be brave, and when my own hero, John Lennon, expressed his own considerable courage in very different ways. 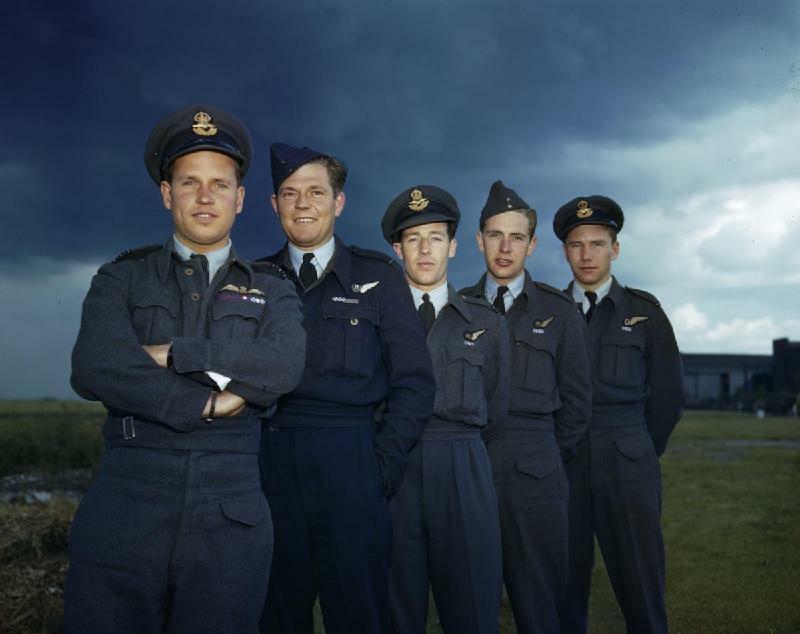 Wing Commander Guy Gibson and his Dam Busters crew, courtesy of the Imperial War Museum. “The few,” as Churchill described the RAF three years earlier. Gibson and the rest of 617 Squadron became my heroes of their heroic era, when the Nazis of Hitler gave us evil to battle cleanly and unambiguously. The dam busting Lancasters had lights mounted on the nose and tail of their planes. Where the beams met in a figure eight on the surface of the water was the correct height to release the bombs: altimeters didn’t work that low in valleys, and dropped from the wrong height the bomb would be smashed to pieces or, worse, explode close to the plane. In other words, these bombers lit themselves up like a Christmas tree so that the gunners defending the dams could target them! The majority of the planes did make it back to England, somehow, a tribute to the skills of those flying in them: but 53 of the 133 airmen who participated in the mission never saw their homes again. They must have all had a good idea of what their odds were when they set out to drop bombs at a speed of 220 mph over the Ruhr. The morning after the Dam Busters had done their work. A reconnaissance photo taken by Flying Officer Jerry Fray of No. 542 Squadron from his Spitfire PR IX. 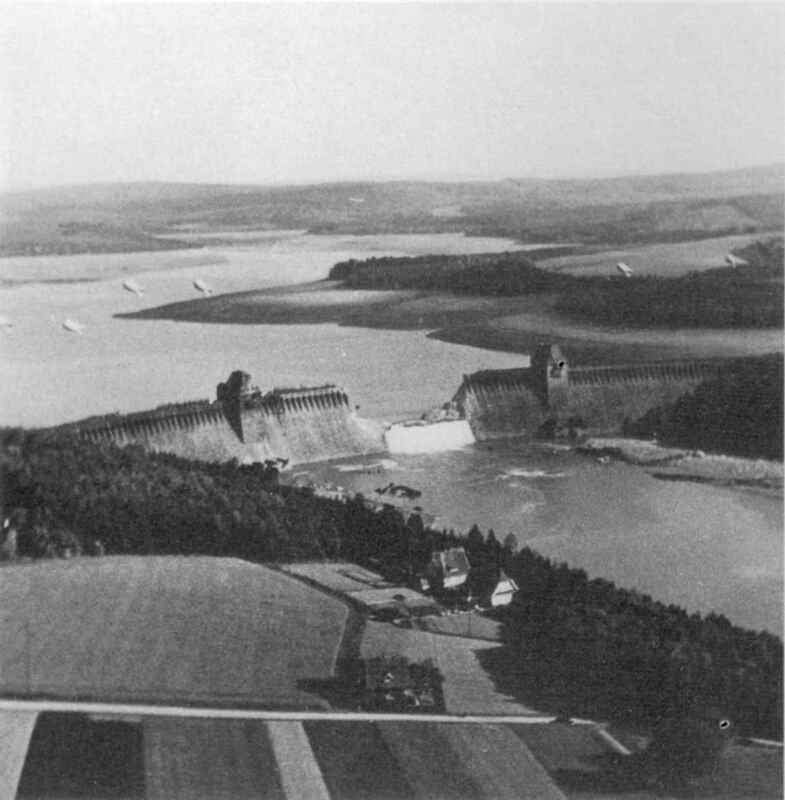 Six Barrage balloons are tethered above the dam. As the leader, Gibson was the first to drop his bouncing bomb (each plane only had one), and he then circled around overhead above the first dam while other Lancasters made their bombing runs, to draw the enemy fire away from the unexploded bombs. This video, taken from the 1955 film about the Dam Busters, will give you an idea of his courage. Even though he had no other bomb to drop, he then flew on to the next dam with the planes carrying the three remaining bouncing bombs. His King awarded him a Victoria Cross, the UK’s highest military decoration, for “valour of the highest order.” Rarely do such superlatives appear to understate. With Angela during a visit to her place in Rye, East Sussex in 2008. Not wanting to mention him in person, I asked Aunt Angela if she remembered the Gibsons, her grandmother’s sister’s family. “Oh, Guy!” she exclaimed immediately, without the slightest hesitation. I nodded yes, feeling a flood of something, maybe pride. “Well, you remember how I met your great-grandfather and his family?” I did indeed. Her mother, “Maisie” née Munro, used to parade Angela and her brother around cousins’ houses in London on Sunday afternoons to perform for the family. 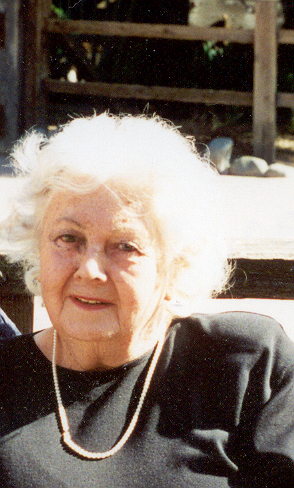 Her mother wanted to, and did, develop the creative sides of her children. “Just as we performed at your great-grandfather’s home in Paddington, so we performed at the Gibsons’ home in West Kensington. And one Sunday, Guy asked me out for a walk with him.” She stressed the word “walk,” and looked at me carefully to make sure that I understood the implications. I think that I did. 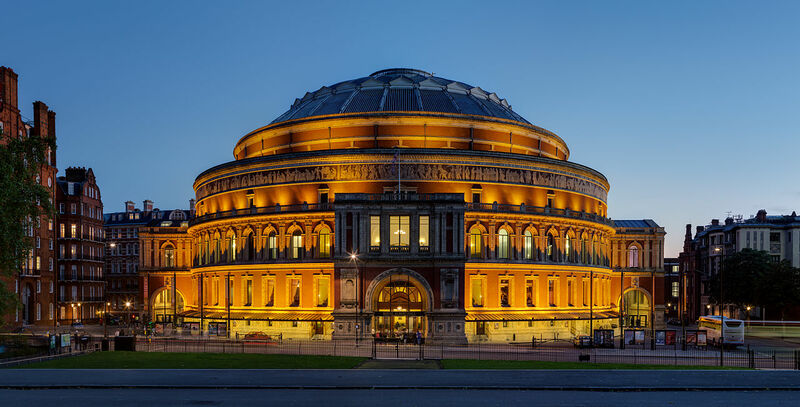 The Royal Albert Hall, South Kensington, London, in 2012. Photo by DAVID ILIFF. License: CC-BY-SA 3.0. She was particularly partial to memories like this – they were at the core of our relationship – and chatted on in a very lively manner for over an hour, flitting backwards and forwards, all over the place. Pulling out a notebook, she showed me a list of famous people whom she had known: it included the Princess Elizabeth, the young woman who has now served as Queen for sixty years. She bubbled about how much easier it was to perform at the Royal Albert Hall than in the homes of relatives: I took a mental note to ask her what she had been doing at the Royal Albert Hall. Then I remembered escorting her to a Sunday service at her parish church in Rye a few years previously. During a hymn, an angelic disembodied voice floated over my head, somewhere over the pew in front of us. It was an extraordinary voice, clear and beautiful, and I finally figured out that it was Aunt Angela’s. She had not occurred to me as its origin at first, because she was already so frail in appearance and that voice so full and resonant. I complimented her on her beautiful voice in the churchyard, as she greeted the vicar and her other friends. She paused and glared at me: “well of course, dear, I was trained!” She was indeed, at the Royal Academy of Dramatic Art. Angela with her two daughters, Veronica on her right and Colleen on her left. Veronica and her family lived much of the time in Aberdeen, and Colleen and her family in Italy. This was taken in the garden of her home in Rye, with the English Channel (I think) in the background. Her mood changed in the room at the rest home, and she started worrying about her estate. She hadn’t been able to look after herself for about a year, and her home sat vacant. She hated no longer living in her own home, and not being able to remain independent. She was lonely. Also, the emptiness of the house worried her. Were her prized possessions all safe? How could she ensure that both sides of her family shared equally in her estate? I tried to talk her through her options, but unwittingly found myself looking rather indiscreetly at her foot, which was all red and swollen with puss, to the point of being disfigured. She couldn’t really stand on it. It reminded me of mum’s feet upon occasion during her last year, which had swelled up in the same way, a gross reminder of her body’s mortality. Out of nowhere, Angela announced that she married at the age of 18, already pregnant and with no idea how the baby had arrived there. Of course, I was shocked: that was her intention. She wanted to point out something of the downside of her upbringing as a girl at a time of widespread ignorance of intimate matters and its accompanying sexism. It was an anger that had underpinned, almost silently I think, her whole adult life. She had been the first in her family to attend RADA, but had been obliged to abandon her schooling because of her youthful marriage. Her little brother had followed her to RADA, and had made for himself a long and distinguished career as an actor. 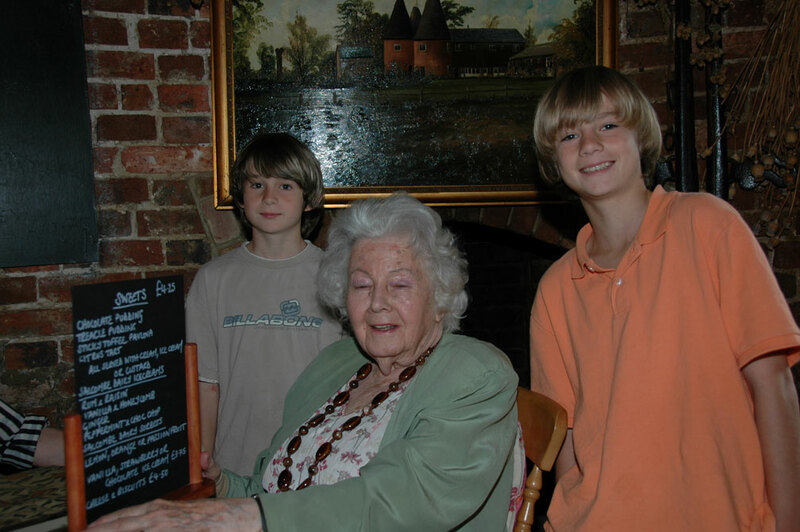 Alex and Charlie flank Angela in the Playden Oasts, her local pub, during our summer 2007 visit. Our conversation had bounced and jumped around, covering a whole lot of ground. It was strikingly energetic and well-rounded, even as Aunt Angela could barely search without help through the stacks of papers and odds and ends that surrounded her. That was just like mum too. As I got up to leave, I told her that I would probably be visiting the UK next summer, and would come and visit her again then. She just looked at me without saying a word, but the message on her actor’s face was very clear: “don’t be ridiculous, dear.” She always added a “dear” when she remonstrated with me. 90 years old, she apparently knew that she was on her way out. She had been cramming so much into our time together during this visit because she knew that it was to be our last time together. I was very grateful. Early in 2008, we took a walk around Rye Harbor. A keen and piercing sadness accompanied me down the stairs in her rest home. It was about a hundred yards along the street to the sea front, and the sadness followed me there. I probably wouldn’t see her again. Good-byes are not great at the best of times: goodbyes for good are awful. I thought back on my faux pas during this visit, during all the visits, wishing I could go back in time and fix them. Along the sea front was a Victorian promenade, wide and open and light. The South Coast of England was at its summertime best, with wispy white clouds scudding across the afternoon sky, and their shadows flying across the surface of the English channel. I watched the little wavelets lap onto the gravel beach in front of the very English beach huts, and all of a sudden smiled. It was all okay, and not just because it was a beautiful late afternoon at the English seaside. It was okay because Angela had met the Princess Elizabeth, and because she had performed at the Royal Albert Hall. It was okay because she had been the songbird in the forest who had sung the best. And it was okay because as a young woman in full bloom, during her 17th or 18th year, on a sunny Sunday afternoon in West Kensington, she had taken a walk alone with Guy Gibson, a young man who was still to become a full-fledged and richly deserving national hero.